Whenever new technologies get introduced, it takes some time to gain traction before they become mainstream or even ubiquitous. Telemedicine has been in use in one way or another almost since the telephone was invented. It just makes sense that medical professionals would use telecommunications as a way to treat patients at a distance. But the way that telemedicine is used has taken a dramatic turn over the last few years with new business practices and technologies making it a more important channel for healthcare delivery. We’re convinced that this is the year that telemedicine becomes part of the normal healthcare routine. Three things happened that made it possible for telemedicine to become a widely-used approach to healthcare. First, high-speed internet connections became available and affordable for many Americans and their doctors. Next, the explosion of smartphones and other mobile devices with video capabilities eliminated the need for dedicated hardware. Finally, commercial software solutions were developed to enable secure video conferencing, integrated scheduling, and streamlined billing for providers. In addition, patients became comfortable with the approach. In fact, 74% of patients surveyed now say that they would use a telemedicine service if available. There’s no doubt that consumers see the value. Providers are on board as well. 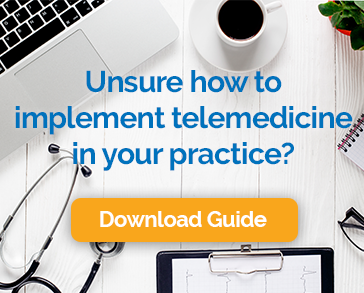 A recent study by the American Academy of Family Physicians revealed that 78% of respondents believe the use of telemedicine will lead to improved access and higher quality healthcare. They also believe that telemedicine improves the continuity of care. Greater Convenience: Patients don’t have to take time off work, worry about child care arrangements, spend time commuting, pay for parking, or sit around in crowded waiting rooms. Lower Costs: Telemedicine is not appropriate for every type of encounter, but when it is used it can save even insured patients a lot of money. For example, using telemedicine for triage could save someone the extra co-payment expense of an emergency room or urgent care visit. Improved Health Outcomes: Telemedicine improves health outcomes by making it easier for patients to show up for follow-up appointments. It also makes more frequent monitoring of chronically ill patients or people on medications more practical. It can be used for things like weight management and smoking cessation to improve overall health, rather than responding to only acute conditions. Increased Flexibility: Online only healthcare providers will give patients one option for receiving on-demand care, but telemedicine can also be used by traditional providers to extend office hours or offer weekend appointments without adding office staff or expense. This flexibility is a boon for providers who want to work from home from time to time or adjust hours to achieve a better work/live balance. Access: The shortage of providers is a growing problem, particularly in rural and other underserved areas. Not only will telemedicine help by allowing the providers we do have to see more patients every day, it will also make it possible for people to seek out the help of the best specialists, not necessarily the closest. What Technical Capabilities are Needed? Secure, High-definition Video Conferencing: The quality of video is very important to every telehealth encounter. It is also essential that the connection is secure enough to comply with HIPAA’s tough standards. Consumer apps don’t meet the security threshold. That’s why purpose-built software must be used. Integrated Scheduling: In most cases, practices will be adding telemedicine software to their EHR or practice management application. It is important to look for a platform that will integrate with the EHR to avoid scheduling headaches and make booking a video appointment easy for staff. A High-speed, Reliable Network: Most physician’s offices these days have internet bandwidth sufficient to support telemedicine along with all of the other cloud-based applications in use, but if yours doesn’t an upgrade may be the right way to go. The internet has changed a lot about our day-to-day lives. How we shop, how we communicate with friends and co-workers, even how we get around town and order dinner have been impacted by digital technology. In that environment, it’s no wonder that telemedicine has taken off.